I want to roll out of bed and have a cup of good coffee, and I mean now, dammit! OK, there are a lot of fancy high price coffee makers out there that will give you a good cup of coffee. I really like cold brewed. You can buy a commercial cold brewer called "coffee toddy" or something like that, but it is set up to run a pound at a time and I don't drink it fast enough to consume it all before it starts tasting a little off. There is also a considerable mess factor and it uses a rubber plug that is always getting lost, leading to questions about the history of rubber stoppers from the chemistry storeroom. 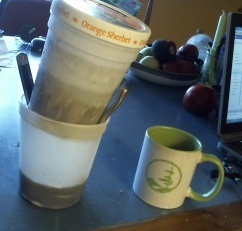 Here is my answer: Make a low cost, DIY, size appropriate cold brewer out of plastic ice cream tubs. Get three one-quart ice cream tubs and drill a bunch of holes in the bottom of two of them. Quarter inch is a good size. These are the inner and outer baskets. 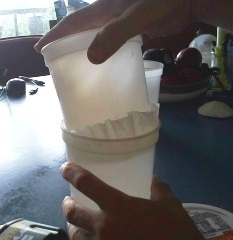 Place a small size, basket type paper coffee filter on top of the outer basket and force it into the outer basket with the inner basket (as shown below). Fill the inner basket with coffee grounds to be level with the top of the filter. Put the basket assembly into the third (unmolested) tub and add cold water. Do not add so much water that the level is above the rim of the un-drilled tub or it will overflow. Put the lid on the top basket and place the entire assembly in the refrigerator to steep for at least 8 hours (two days seems optimum). After steeping, remove the assembly, lift the two baskets up to drain, and support the basket assembly with a couple forks (figure below). Once the dripping slows, pour a couple of cups of cold water into the top of the filter assembly to wash the grounds. When that stops dripping, you have a good coffee concentrate that you can dilute to taste and will stay fresh in your fridge for the better part of a week. Now, anytime you want a cup of hot coffee, just fill a cup about 2/3 full of water, heat that up in a microwave, and fill to the brim with your cold coffee concentrate (note that you never heated the concentrate, so it will not get bitter the way coffee left on a burner will). Can I make good coffee with cheap grounds? -- no. While it has been reported that an army travels on it's stomach, it is my experience that science labs run strictly on caffeine. I vote we form a coffee subcommittee for the Barnraising. I pledge to bring an aeropress and at least a pound of whatever smells good from my local coffee shop. Who's bringing the kopi luwak? Have you analyzed your different brew techniques using the Spectrometer? 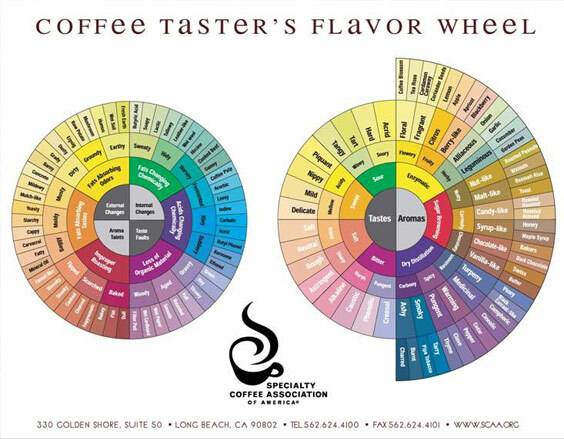 Do you think we would see the spectrum for flavor? I live in Melbourne, the home of coffee addicts in Australia. Have you heard of the Aero Press? My partner has one. You can get them everywhere these days. Also, this might be of a help if you carry out @btbonvals suggestion. I'm glad to see the Public Lab community elucidating the basic infrastructure of scientific research.